The NHS identity check system that forces thousands of patients to pay upfront costs for treatment is claiming its first victims – and unknown numbers of others are becoming trapped in a process devoid of common sense or compassion. And British citizens aren’t immune. Former British Army corporal Jellian Mitchell discovered that when her mother Evette White visited from Jamaica and suffered a severe stroke. They are victims of a dysfunctional system that deters patients from seeking care and turns frontline NHS staff into unwilling border guards and agents of the hostile environment. Rules introduced last October means that overseas visitors and migrants considered ineligible for healthcare are charged upfront for their treatment. If they can’t pay, they don’t get treated, unless the treatment is considered urgent when the NHS has a duty to provide it. 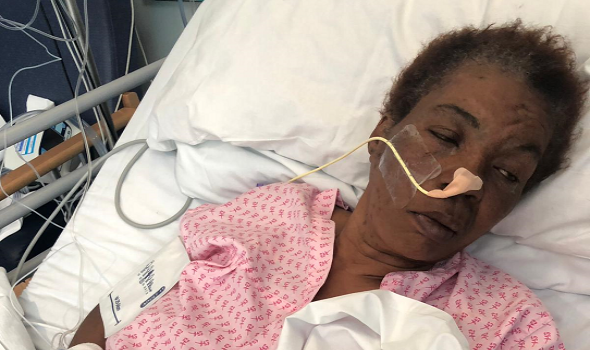 But the case of Elfreda Spencer, a 71-year-old Jamaican woman who fell ill while visiting family and was diagnosed with advanced cancer, shows that doesn’t always happen. Her case was revealed by a Guardian investigation published on 13 November. Unable to pay £30,000, Elfreda was denied the immediate treatment she needed. Her cancer later became terminal and she died. But the dysfunction of this system doesn’t end there. Those who are given the life-saving treatment they need can quickly become trapped in a nightmarish situation, forced to make the impossible choice between stopping treatment prematurely or paying tens of thousands of pounds they can’t afford. That’s the choice that Jellian and her mother Evette now face. Jellian, 37, says she got her British passport in 2004 and served for 14 years in the British army, including a tour in Iraq. Struggling to adjust after a medical discharge earlier this year, Jellian was visited by her mother Evette, 58, a Jamaican national. A few days before she was due to fly home, Evette suffered a severe stroke that left her paralysed on the right side of her body, unable to talk, eat or walk, Jellian said. She was rushed to hospital in Birmingham. It’s been nearly two months and Jellian has seen little change in her mother’s condition. She’s now being fed through a tube to her stomach and needs specialist nursing care, Jellian explained. Evette is unable to fly back to Jamaica, but she’s not eligible for the rehabilitation treatment that she needs to regain full use of her body. 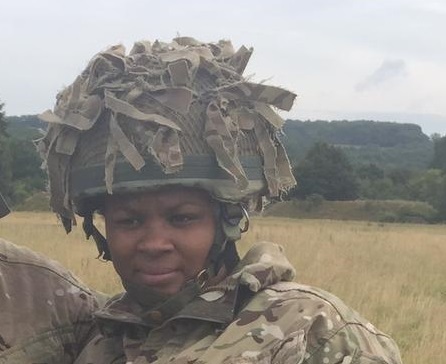 Jellian Mitchell served in the British army from 2004 to 2018. And Jellian knows that she will soon get a bill for tens of thousands of pounds for the treatment Evette has received after the initial urgent care. After just two weeks of care, she was told the bill stood at £7,000. Jellian and her mother are stuck in the cracks of the system. Migrant Voice raised concerns about the new charging system on the day it came into force last October. On that day, a former NHS chief executive and hundreds of medical professionals pleaded with the government to change course, but to no avail. Research at the time suggested that pregnant and seriously ill migrants were already going without medical care due to fear of the new system. With an estimated one third of vulnerable migrants saying that they were being deterred from seeking medical help, we were concerned that the policy would put wider public health at risk and place additional pressure on already strained emergency services. It’s a policy that makes no sense, on a financial, logistical or human level. On 12 November, Migrants’ Rights Network and human rights organisation Liberty announced that they had won a legal challenge against the data-sharing agreement between the Home Office, the Department of Health and NHS Digital that forces patient information into the hands of immigration officers. It was a big win and one we should celebrate. But it was just one battle in a long war. Our hospitals (and our schools, doctors’ surgeries, banks and housing system) are still hostile environments for many migrants and visitors to this country. The NHS should be a place for medical care not border control, and the human cost of the current charging system is simply too great. It runs counter to the fundamental mission of medical care entrusted to our nurses and doctors, and it must end. Top image: Evette White suffered a stroke in September and still requires specialist medical care.